Meth Is Back. It's Stronger, Purer And Snaring Another Rural Generation : Shots - Health News Meth is back "with a vengeance," police say. Now made mostly by superlabs in Mexico, it is stronger, cheaper and more prevalent, cutting across demographic barriers and sparking serious crime. Methamphetamine Roils Rural Towns Again Across The U.S.
A drug specialist in the Mexican army shows crystal methamphetamine paste seized at a clandestine laboratory in Mexico's Baja California in August. Much of the meth sold in the U.S. today comes from Mexico, according to DEA officials. The sharp rise in opioid abuse and fatal overdoses has overshadowed another mounting drug problem: Methamphetamine use is rising across the United States. "Usage of methamphetamine nationally is at an all-time high," says Erik Smith, assistant special agent in charge of the Drug Enforcement Administration's Kansas City office. "It is back with a vengeance." he says. "And the reasons for that are twofold." The drug's now stronger, and cheaper, than it used to be. 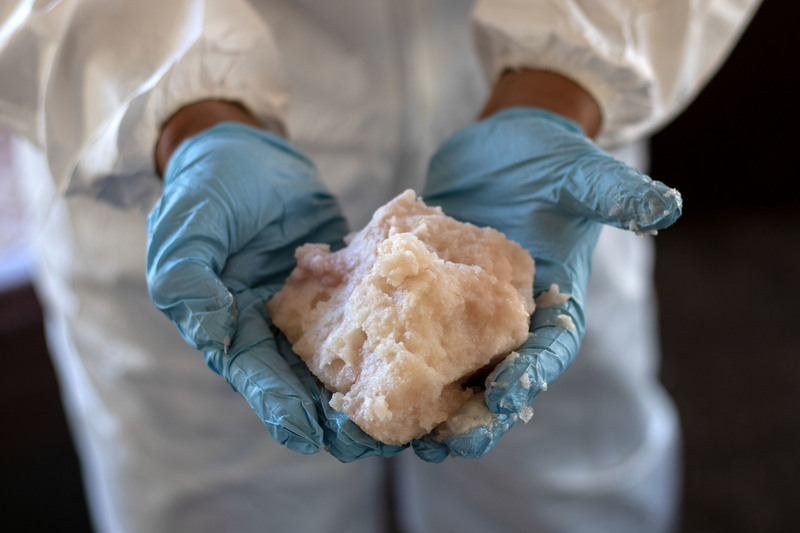 No longer chiefly made by "cooks" in makeshift labs in the U.S., methamphetamine is now the domain of Mexican drug cartels that are mass-producing high-quality quantities of the drug and pushing it into markets where it was previously unknown. But even in rural communities ravaged by decades of experience with the drug, meth is on the upswing thanks to its relatively low price, availability and a shortage of treatment options. 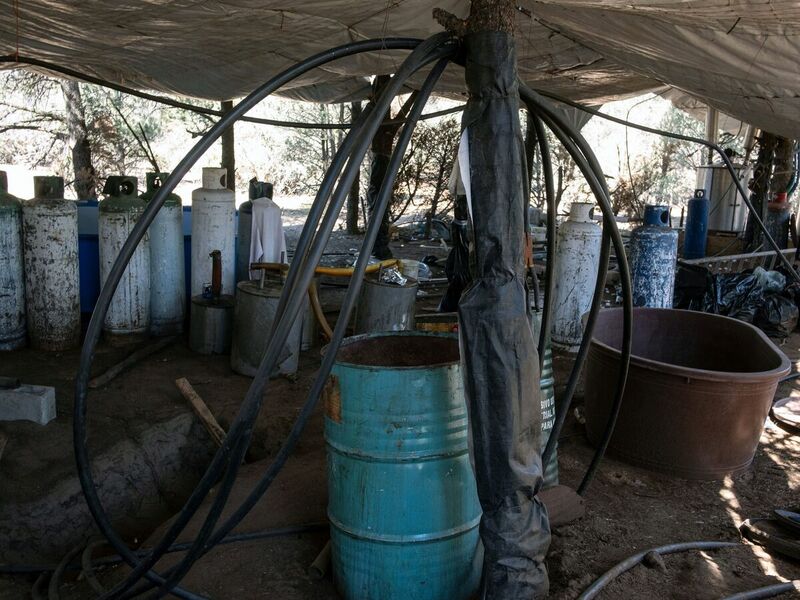 Before it was shut down last summer, this clandestine lab in Mexico's Baja California was said to be capable of making 200 kilograms of crystal meth daily. Southeast Missouri is often called "the Bootheel" because that part of the state resembles a heel-like protuberance into Arkansas. Locally produced meth started taking hold in the Bootheel in the 1980s, in little towns such as Qulin, where it snared generations of residents like Dustin Siebert. "I started using methamphetamine when I was 18, 19 years old," says Siebert, rubbing his tattooed hands. "And, months later — some four or five months — I was helping other people manufacture it. Took over my life," Siebert says, "like it did just about everybody else in this area." Siebert says he's been off meth for four years, but he says many people in the town of 450 residents have never been able to fully shake it. Amber Windhorst, the school social worker in Qulin, agrees. "A high number of our kids are affected by drug use in the home," she says. "Or Mom and Dad have left because they're out using." Windhorst says grandparents are raising many of those kids, but meth use now spans three generations in some families. "A lot of times we are teaching our children how to survive," Windhorst says. "Because you have everything that goes with the drugs — lack of food, lack of safety, shelter." Not to mention theft, prostitution and a recent outbreak of hepatitis A.
Meth use dipped early this decade after lawmakers cut access to key ingredients — such as the over-the-counter decongestant pseudoephedrine. Siebert says it was about the same time that opioids took hold in the region. "Now that they're hammering down on the opiates," Siebert says, "guess what's happening? Now the meth is coming back in"
Law enforcement agencies say drug cartels are pumping cheap, potent methamphetamine from "Mexican superlabs" through established distribution networks for heroin and cocaine. Sgt. Mark McClendon, of the Missouri Highway Patrol, says meth is reaching places and people it never did before. "The meth problem has basically exploded a across every race and social economic class that you can imagine," McClendon says. But at least in Missouri, drug policy isn't keeping up. The state prioritizes opioid addiction over methamphetamine addiction, making intensive treatment for uninsured meth users hard to come by. And, in contrast with opioids, clinicians have no government-approved medications to help treat methamphetamine addiction. In fact, just about the only response in southeast Missouri seems to be a crop of new, faith-based meth support groups that have sprung up. "Campbell's got one, Malden's got two, Qulin's got one," Siebert says. "Poplar Bluff's got one every night of the week." He founded his own group — the Matthew 25 Project. On a recent Thursday night, a little more than a dozen people — a mix of those addicted to meth, some recently weaned off the drug and others just offering support — met in a stark white room at the Qulin Assembly of God church. Siebert preaches that God made lots of people with addictive personalities but intended them to be addicted to religion. "We're supposed to be addicted to him, and the things of the Kingdom," Siebert tells the small group. He maintains that limiting access to drugs only creates demand for other drugs. "Because the problem is addiction," he says. "Until they figure out why people want to get high and use drugs, it's always going to be something else." Siebert says the decades of experience that southeastern Missouri has with methamphetamine should serve as a warning to parts of the country where use of the drug is only now starting to spread.